Coming to an end to the DC tour meant we would end up at Peregrine. 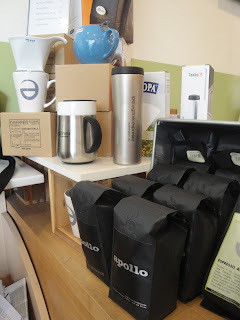 Opening in 2008 (former spot of another Murky Coffee location) is located in the pristine neighbourhood in Capitol Hill where the streets were unbelievably clean. Eerie to a point that I felt as if I was in Singapore. THAT CLEAN! Sammy made sure we got a chance to make it before heading to Cafe Pronto. Rolling up into the cafe, the outdoor patio was bustling during the afternoon lull. 2PM and it was the hangout spot. Notice several bags of 5lbs. coffee bags sitting outdoors - by the door. When I inquired with the baristas, "its free for anyone - mostly used as fertilizer for gardens." Such a great way to re-use coffee grinds, and reduce our impact of unnecessary waste. Glad that Peregrine makes a conscious effort to reduce their impact. Verdict: Buttery mouthfeel, with sharp hints of lemon, and savory caramelized sugared cinnamon. Hickory, sweetness, and deep cocoa finish. Their marble espresso bar is definitely a great design aspect - along with their colours for their cafe. Nice warm green accents that makes you all fuzzy. Thoughts of the cottage immediately pop into my head, with the lake in the foreground and the sun shimmering in your eye as it bounces off lake. They also have all your brewing needs! Wish I was back in the D.C. Area.